Chloe slingback booties in embossed leather. "Wave" is made in Italy. Alexander McQueen smooth leather booties with crystal stud trim. 4.1" metal stiletto heel. Pointed toe. Buckle belt strap at upper. Back zip eases dress. Leather lining and sole. Made in Italy. 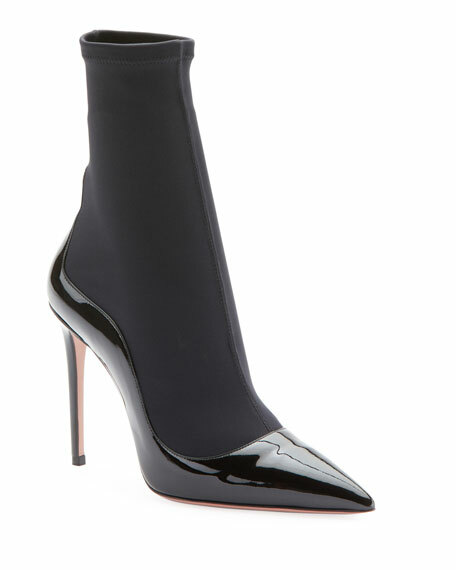 Aquazzura stretch-knit and patent leather pump-style booties. 4.3" covered stiletto heel. Pointed toe. Pull-on style. Padded footbed. Smooth outsole. "Zen" is imported. 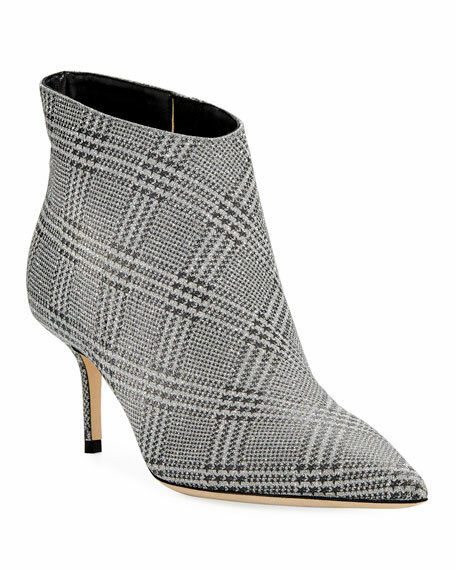 Jimmy Choo houndstooth star-print prince of Wales plaid fabric booties. 2.5" covered stiletto heel. Pointed toe. Slip-on style. Leather lining and sole. "Marinda Prince Of Stars" is made in Italy.